3 Questions About A Pro-Russia Congressman's Meeting With Julian Assange Rep. Dana Rohrabacher, R-Calif., met in London with Julian Assange — and has a secret message from Assange for President Trump. Rep. Dana Rohrabacher, R-Calif., plans to "divulge more of what he found directly to President Trump," he said in a statement. In their tête-à-tête, Assange denied that Russia was involved in the hacking or disclosure of emails stolen from the Democratic National Committee during the 2016 U.S. presidential campaign and published online by WikiLeaks, Rohrabacher's office said. U.S. intelligence agencies say Russia was behind the cybertheft and used WikiLeaks to distribute the pilfered data. Moscow denies the allegations. The congressman and WikiLeaks founder also discussed "possibilities" that would allow Assange to leave the embassy where international diplomatic protections have kept him from being arrested, Rohrabacher spokesman Ken Grubbs told NPR. Rohrabacher plans to "divulge more of what he found directly to President Trump," he said in a statement. Rohrabacher represents California's 48th Congressional District — a sunny stretch of coast in Orange County. He has had a long and colorful career in politics, stretching back to his days as a speechwriter and aide to President Ronald Reagan. 1. What are Rohrabacher's connections with Russia? Rohrabacher has long harbored a fondness for Russia — views that put him at odds with the Republican mainstream and have earned him the tagline "Putin's Favorite Congressman." Rohrabacher says his affinity for Moscow dates back, oddly enough, to a weeklong trip he made in 1988 to visit the Afghan mujahedin fighting the Soviet Union. Since then, he realized his fight was against Communists, not Russians per se, he told the Los Angeles Times this year. 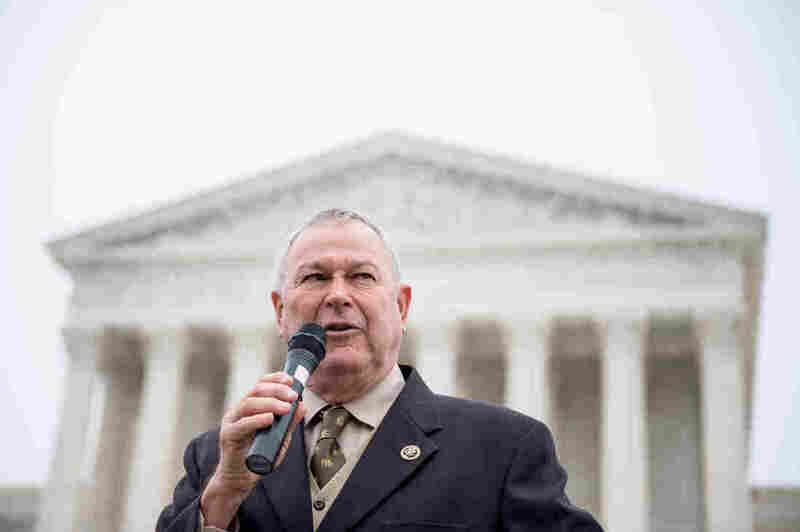 After the Soviet empire collapsed and Russia moved toward democracy in the 1990s, Rohrabacher cheered Moscow in its halting transition from communism to free market capitalism. He also got to know Russian officials, including a then-little known deputy mayor of St. Petersburg by the name of Vladimir Putin. Rohrabacher claims to have lost a drunken arm wrestling match to Putin in the early '90s at a bar in downtown Washington after a game of touch football. How does the California congressman view the man who rose to the Russian presidency? "He's a tough guy, and he's supposed to be a tough guy," Rohrabacher told NPR member station KPCC in 2013. "That's what the Russian people want. But that's not a reason we shouldn't try to work with him." Rohrabacher's positions on Russia largely correspond with Trump's, but they have won him few other friends in Washington, particularly in light of Moscow's interference in last year's presidential election. Even his own Republican leadership has taken swipes at him. Last year, House Majority Leader Kevin McCarthy was caught on tape saying: "There's two people I think Putin pays: Rohrabacher and Trump." McCarthy later said his comments were "a bad attempt at a joke." 2. Isn't it unusual for a member of Congress to have such close ties to a foreign government? Yes — the FBI reportedly warned Rohrabacher in 2012 that Russian intelligence services were trying to recruit him as an "agent of influence" to help steer U.S. policy in Moscow's favor, according to the New York Times. Rohrabacher said he was aware of the dangers when meeting with Russian officials, and there is no evidence the congressman ever entered into an agreement with Moscow. But that doesn't mean Rohrabacher has shied away from contacts with Russia. In July, an American financier accused Rohrabacher of using information he obtained from the Russian government to try to change a U.S. anti-corruption, pro-human rights law called the Magnitsky Act. The Kremlin strongly opposes the law, which is named after an attorney who died in Russian custody after uncovering evidence of corruption by government officials. After Congress passed it in 2012, Putin retaliated by suspending American adoptions of Russian children. The Magnitsky Act entered the public spotlight this summer thanks to Donald Trump Jr.'s emails about his meeting with a Russian delegation during last year's presidential campaign. Trump Jr. originally said the discussion was about "adoptions," which, to Russians, means the Magnitsky Act. According to the emails, Trump Jr. agreed to take the meeting because the Russian government wanted to offer compromising material about Hillary Clinton. 3. What did Rohrabacher and Assange discuss? The meeting, which was first reported by the Daily Caller, was arranged by journalist and Internet provocateur Charles Johnson. Rohrabacher and Assange discussed the status of WikiLeaks and Assange, whose disclosures over the years have drawn the enmity of the U.S. government, particularly the intelligence community. In April, CIA Director Mike Pompeo went so far as to call WikiLeaks a "non-state hostile intelligence service often abetted by state actors like Russia." As for Assange, Pompeo called him a "narcissist who has created nothing of value. He relies on the dirty work of others to make himself famous. He is a fraud — a coward hiding behind a screen." During the 2016 campaign, WikiLeaks released emails hacked from the Democratic National Committee and Clinton campaign chairman John Podesta. American spy agencies say the group received those materials from Russia. In his meeting with Rohrabacher, Assange "emphatically stated that the Russians were not involved in the hacking or disclosure" of the emails, Rohrabacher's office said. Rohrabacher spokesman Ken Grubb said the congressman and Assange also talked about possibilities that would allow him to leave the embassy, as well as what Assange knows about the DNC leaks. Grubb said no proposal is currently on the table.